Cheap Storage Sheds - Who Has The Best Cheap Storage Sheds? When you buy cheap storage sheds for your garden, you shouldn’t have to compromise on quality. With so many affordable models to choose from, in all kinds of substrates, it’s possible to find one that’s just right for you even if you’re on a tight budget. The only difficulty can come in selecting your ideal model, which is why we’ve created this WhatShed guide to the very best cheap storage sheds that can be bought online in the UK today. We looked at their cost and value for money, their durability, aesthetic appeal, and value adding features such as warranties when determining their rankings. 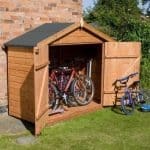 Then we were able to compile our guide to the UK’s best cheap storage sheds that can be purchased online today. One person’s definition of cheap can vary from another’s, of course, so for the purposes of this league table we’ve decided upon a cut off point of four hundred pounds, making them affordable and yet of high quality at the same time. We’ve also decided upon a maximum base area of sixty square feet, thus removing workshops and log cabins from our considerations. In a remarkably diverse and competitive category, which featured timber, plastic and metal sheds, we say well done to the eight foot by six foot Shed-Plus pressure treated shed with onduline roof. 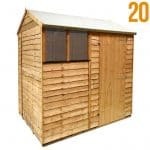 Thanks to its relatively large dimensions, long extended warranty period, traditional good looks and its good value for money asking price, it takes the top position in our league table of the twenty best cheap storage sheds that can be purchased online in the UK today. From sheds to greenhouses, WhatShed bring you independent reviews that can help you make your ideal purchasing decision. 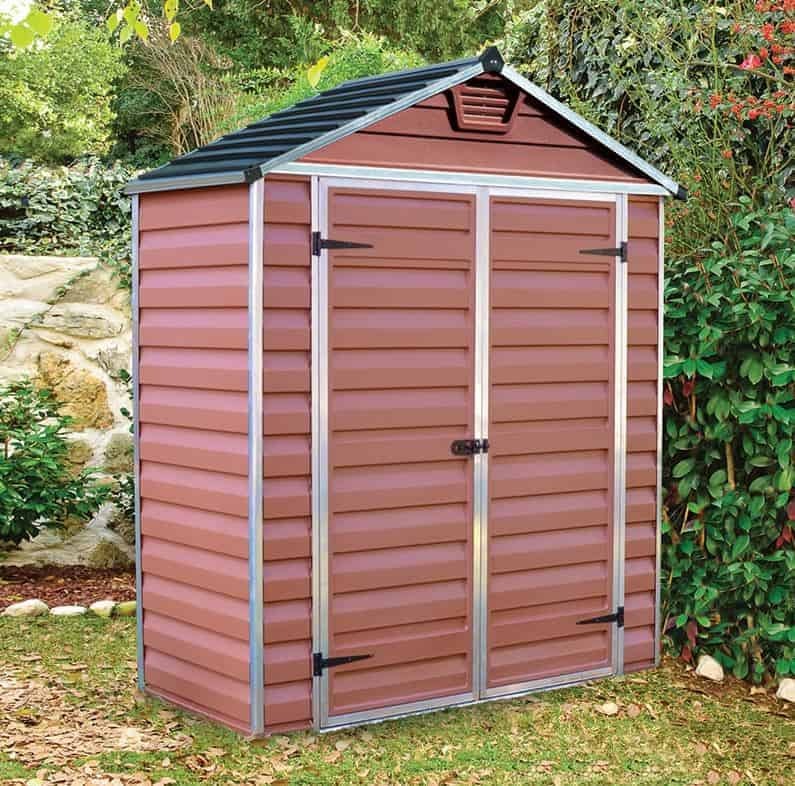 One of the things we like most about cheap storage sheds is that they come in all varieties of substrate, by which we mean wood, plastic and metal. 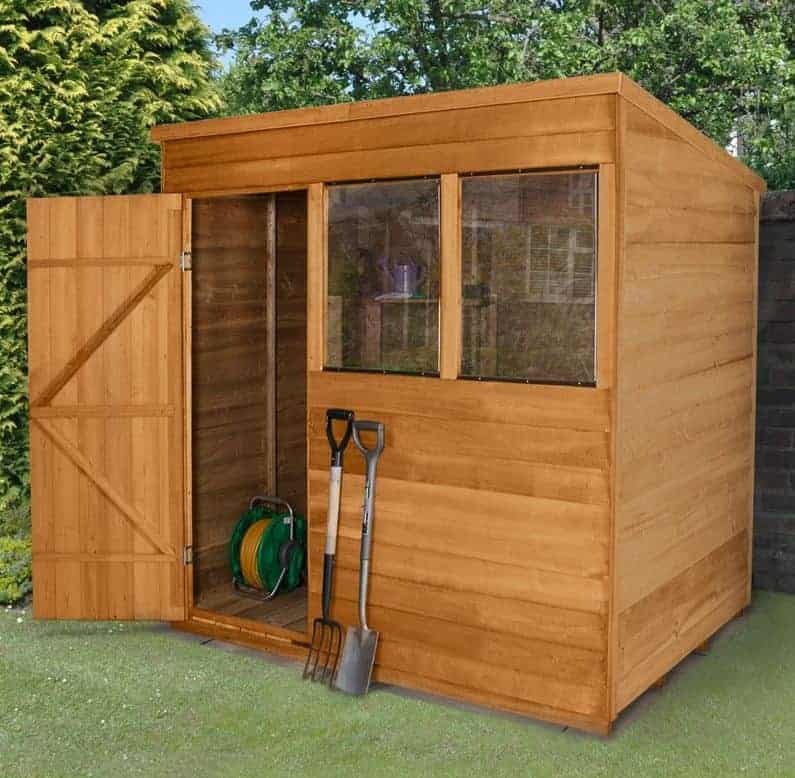 We know that many people, however, prefer the traditional look of a timber garden shed, which is just one area in which this eight foot by six foot shed from Shed-Plus scores very highly. 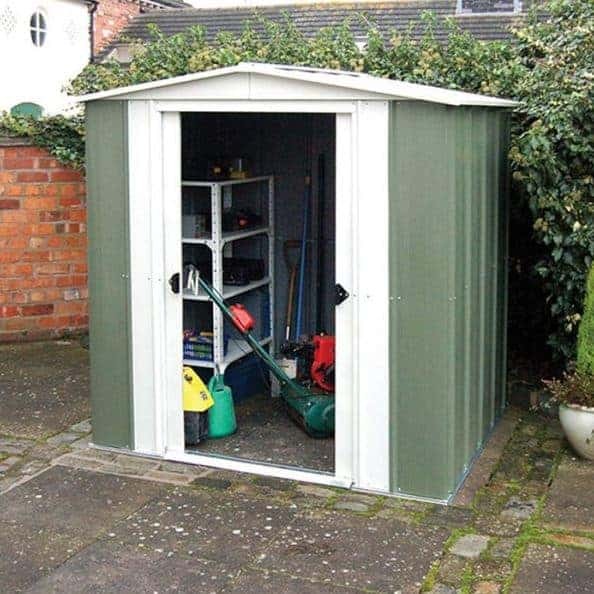 It’s the largest shed in our league table, and yet essentially it’s still compact enough to fit into a small or mid-sized garden without taking up too much precious lawn space. It’s also very tough and durable, and thanks to a range of value adding features we feel it represents outstanding value for money, earning itself the top spot in our league table in the process. Overlap cladding is used for the walls, which helps to keep costs down, but we were very pleased to find that it had been pressure treated by the manufacturer. This gives it excellent resistance to rot, as shown by the 15 year manufacturer’s warranty which is as long as we see given on wooden sheds of any price. We were also impressed by the two large windows on the side panel and with the inclusion of a corrugated onduline roof; it’s a very durable and reliable roof covering that quickly channels rainwater away, and ensures that the contents inside these cheap storage sheds remain dry. We always appreciate good looking yet cheap storage sheds, but whilst these sheds didn’t immediately impress us with their appearance they scored highly in every other department; when it comes to durability and functionality they’re hard to beat, which is why they earn the runner up spot in our WhatShed league table. With the corrugated nature of their cladding they look decidedly metallic, which some people may find off putting, but we feel that the pale green colour scheme gives them a visual lift that a silver coloured shed wouldn’t have. 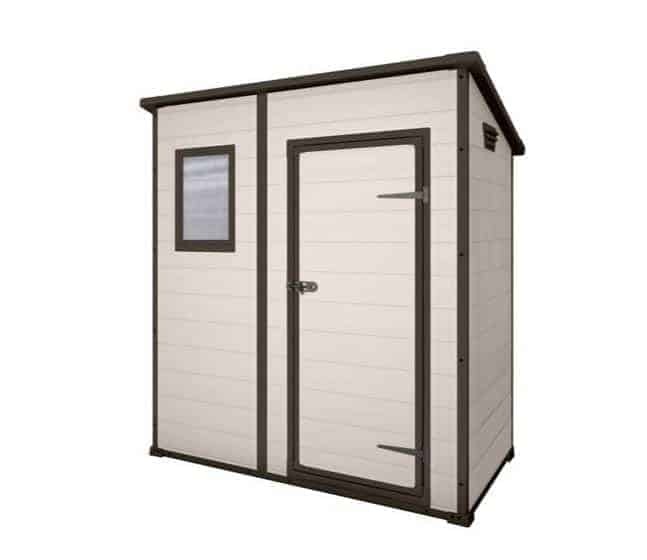 The manufacturer of these cheap storage sheds, Absco, is a big name in Australia that’s becoming noted over here for the durability and weather resistance of their products. 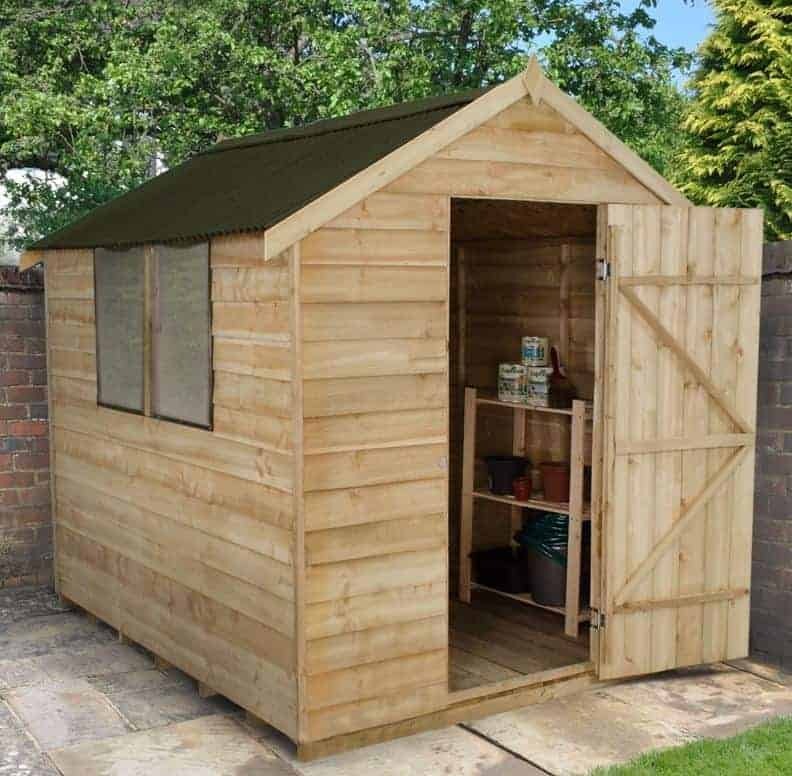 It means that this shed has been tested to withstand winds of more than 90 miles per hour, and it also comes with a 30 year guarantee against rot. 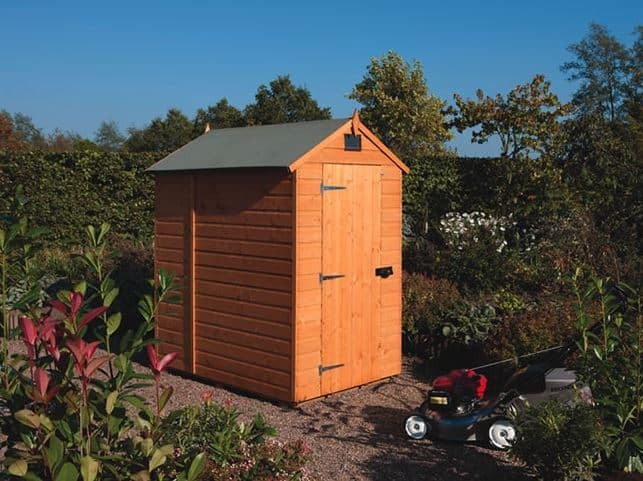 This is considerably longer than we’ve seen on sheds from any other manufacturer, and we feel it provides huge added value as well as peace of mind. Another unique feature of this shed is its SnapTite easy assembly system. The prefabricated sheets simply snap into place along the frame, and we found it a very simple and time saving system to use, so it’s ideal for people who have never installed their own garden buildings before. With a base area of approximately ten foot by six foot these are the largest cheap storage sheds in all of our WhatShed league table. This makes them a much more versatile building, in that whilst they have been designed with storage purposes in mind, thus making them eligible for our guide, they are also roomy enough to spend time inside, and so could even be used as a small scale workshop for either business or leisure purposes. It was also noticeable how tall these sheds are compared to many we review of a similar size, and once again the six foot eaves is perfect for those who want to walk around whilst inside their shed. 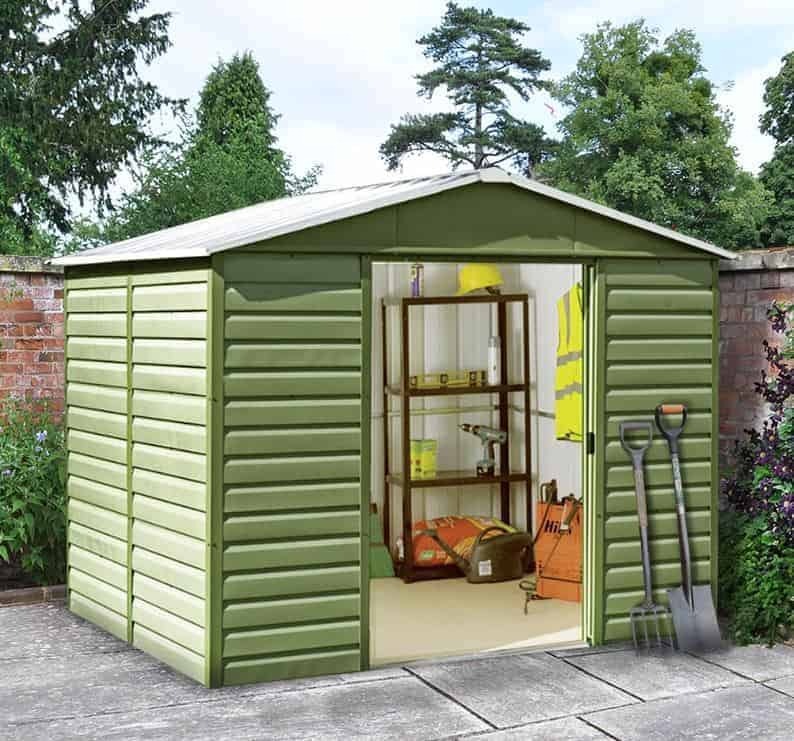 We’ve seen lots of metal clad cheap storage sheds that adopt a green colour scheme, and this makes perfect sense to us as they are after all going to be placed in a garden environment. This model has a more subtle shade of green than we usually see, and it comes without a contrasting white colour as well; we found the overall effect very pleasing on the eye. We were also pleased by the 12 year manufacturer’s guarantee, and the extra couple of years adds extra value that earns this well sized shed a place inside the top three of our league table. If you plan on keeping any items of value inside your cheap storage sheds, then security is going to be a major consideration. That’s why so many of the sheds in this league table have a window free design that keeps prying eyes out. That can lead to a dark and gloomy interior, but this smart timber shed from BillyOh has a very useful solution. It has two windows, so natural light reaches the interior making it easy to store and retrieve items, and yet they are relatively small and placed just underneath the eaves of the apex roof, making it very difficult for passers by to see what’s being stored within and therefore increasing shed security. We were also impressed with the high quality materials that we found used throughout these four foot by six foot sheds. We were pleasantly surprised to find tongue and groove cladding used, rather than more cost effective overlap cladding, and it creates a smooth exterior that makes this shed look much more expensive than it actually is. It’s also one of the taller timber sheds we’ve reviewed in this price range, and the 1.97m of headroom means that you won’t feel hemmed in when inside. It’s worth noting that a floor has to be added as an additional extra, but this can cost less than twenty pounds and so doesn’t detract from the excellent value for money that sees this shed gain a place inside the top quarter of our cheap storage sheds. Metal clad cheap metal sheds make up three of our top five, and we found this metal shed more pleasing on the eye than most that we see, with its green paintwork contrasting with white double doors. These sliding doors are one of the stand out features on this shed, with a wide opening of 0.81m that makes it very easy to carry objects in and out, and that even allow for a wheelbarrow to be used for heavier items such as bags of top soil or compost. We were also pleased to find that the handles were holed and ready for a padlock, so it’s easy to boost the shed’s security if desired. 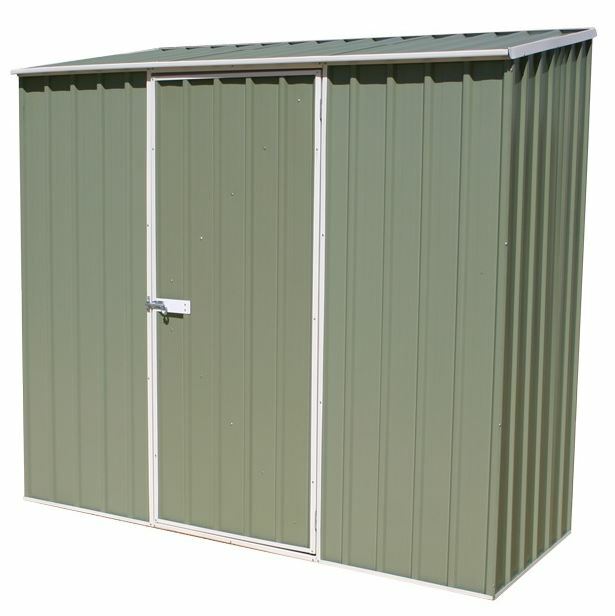 The body of these six foot by five foot cheap storage sheds is made from galvanised steel, which means that although it’s relatively lightweight and therefore easy to assemble it’s also very strong and weather resilient. This is demonstrated by the manufacturer’s 10 year guarantee against rust, which is something that we always like to see on metal sheds. Of course, being metal it’s not prone to rot or insect attack, and it won’t fade as some plastic substrates can do over time. It also requires no maintenance which will be welcome news to those who have previously only had timber sheds in their garden, and so it offers very good value for money. Tongue and groove cladding adds extra strength and stability, so it’s always something that we welcome, but we appreciate that overlap cladding is going to be more prevalent in wooden cheap storage sheds because it’s a more cost effective substrate that’s less expensive to produce. On this occasion it also gives the shed a rustic appearance that we found very eye catching, and it’s sure to be appreciated by those who particularly like traditional garden buildings. 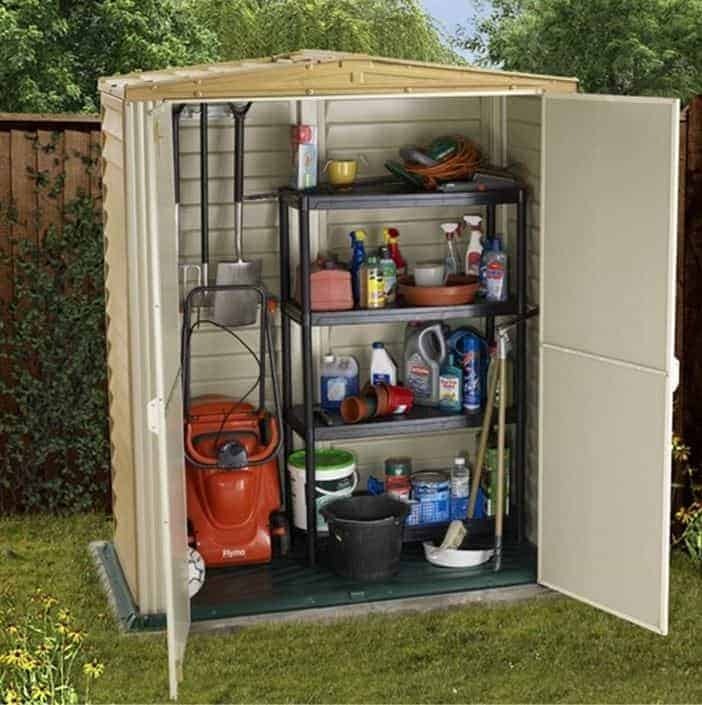 With a base area of 2.07 x 1.54 this is very much mid-sized when it comes to cheap storage sheds, meaning that you can fit a surprising amount of tools and items inside without impacting on the lawn area too much. We were surprised at just how much storage space there is, and that’s thanks to a ridge height at the peak of the apex roof of 2.13m and a taller than usual eaves height. We were particularly impressed by the initial pressure treatment used by the manufacturer, and by the 15 year warranty against rot that it allows them to give. If you want a traditionally styled shed that is strong and durable and which won’t need yearly maintenance, then we feel this should be near the top of your shortlist. 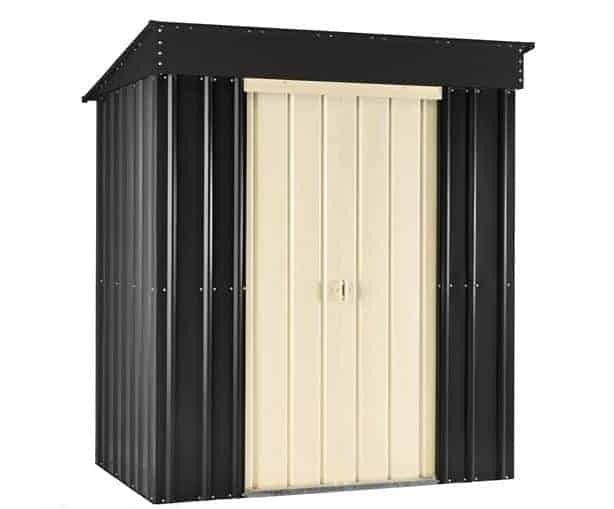 This has a significantly lower profile than most of the metal fabricated cheap storage sheds that we’ve reviewed, with its peak height at the front of its pent roof of just 1.71m to go with its approximately eight foot by four foot base area. This accounts for its positioning lower down our league table, but it does bring with it advantages of its own. The lower height, and the use of an unobtrusive pent roof as opposed to the apex roofs that we more regularly see, means that the shed can potentially be hidden away behind a wall or a fence, and by hiding it from public view this can greatly increase its security. 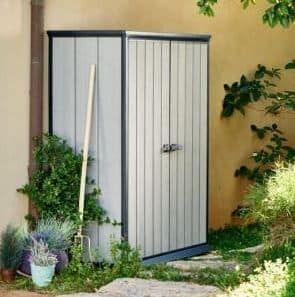 The double doors that come with these cheap storage sheds aren’t the widest that we’ve seen either, but they still open wide enough to allow items such as lawn mowers inside. Due to the flame retardant nature of the cladding we can also imagine it being used as a low cost storage option at a caravan or camping park, where fire safety regulations would prohibit the use of a timber shed. With a 10 year anti rust guarantee included as well, we were very impressed by the value given by the asking price of considerably less than two hundred pounds. Plastic clad cheap storage sheds such as this one bring significant advantages of their own, primarily the fact they are very easy to keep and maintain. In fact the only maintenance it will need is an occasional wash or hose down, and as it’s made from high quality polypropylene it won’t fade or yellow as some plastic sheds of the past have done. Whilst we appreciate that the looks may not be to everyone’s taste, we found them striking from the moment we saw this shed. The white plastic cladding has been given a wood effect finish, and there’s black detailing around the door, window and roof. We feel this gives it a very modern appearance, and one that will fit in well in gardens that already have white PVC features. We liked the inclusion of a window at the front of these cheap storage sheds, which isn’t something that we always see on a plastic clad garden building. It means that the interior should be light and welcoming, and it’s airy too thanks to the in built ventilation panel. This is a very important touch, as plastic sheds that aren’t ventilated adequately can be prone to a build up of condensation in hot and cold weather. We were also pleased to find a 10 year warranty included, although we wouldn’t be surprised to see it last much longer than this without any problems becoming apparent. 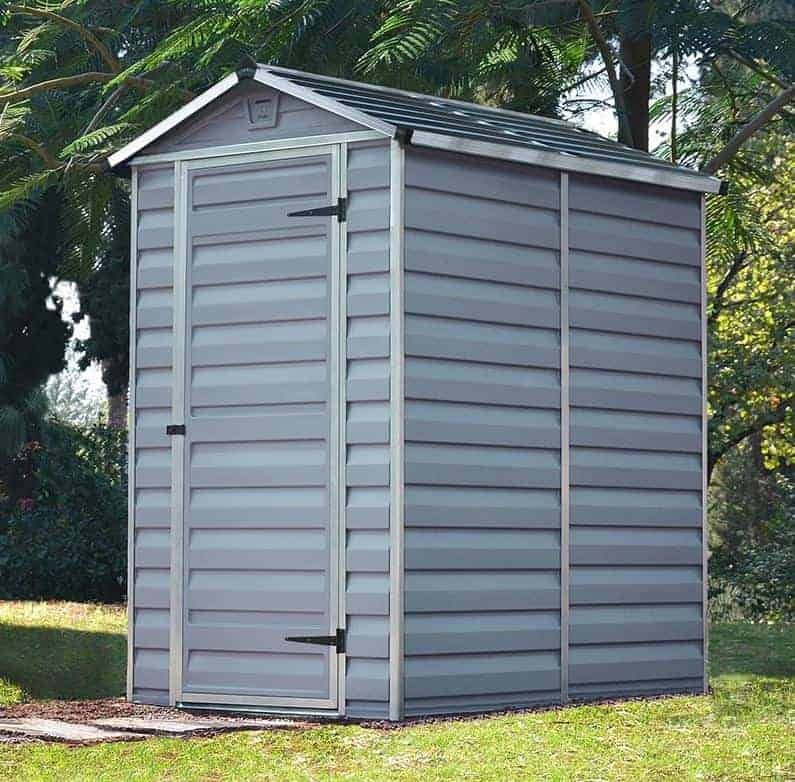 If you’re looking for cheap storage sheds that are made of metal and yet don’t look too metallic, then these coffee coloured sheds could tick all the right boxes. With the metal panels arranged in an overlap fashion as well, from a distance this has the appearance of a timber shed, and even when viewed close up it should blend in nicely with a garden that has wooden buildings or features in it. For that reason we feel this would be a good buy for people who don’t ordinarily like metallic garden buildings, but who want cheap metal sheds that won’t need maintenance carrying out on an annual basis. The majority of metal cheap storage sheds that we see are supplied without a floor and therefore have to be secured directly to a level area of concrete, or alternatively a patio. We were pleased, therefore, to find that this Woodvale shed comes with an integral floor as standard, meaning that it’s quicker to install and very stable once it’s in position. The six foot by five foot base area should be more than enough for most small to medium sized garden’s storage needs, and with a 10 year warranty against rust included they should retain their robust usefulness and their good looks for many years to come. Most of the cheap metal storage sheds that we’ve reviewed with a metal cladding come in either silver or grey, or green, but we’re always pleased to see different colours such as mountain blue adopted as it allows the consumer to find sheds that appeal to their particular tastes. This StoreMore Lotus shed comes in a different colour again, a dark grey which has been christened ‘anthracite’. It caught our eye from the moment we saw it, and the dark paintwork contrasts nicely with the white sliding double doors, creating what we feel is a stylish and very contemporary look. 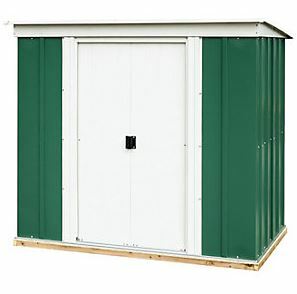 With a base area of approximately six foot by three foot these are among the smaller of the cheap storage sheds to earn a place inside our league table, and the use of a pent roof also means that they can be positioned in areas that don’t offer a lot of headroom. 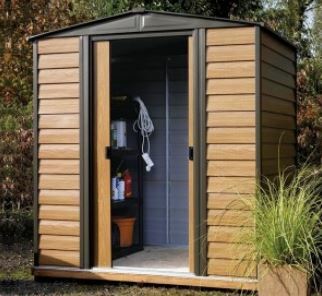 This adds convenience, but what we liked most about these sheds is the very low price tag of not much more than a hundred and fifty pounds that’s attached to them. This excellent value for money is enough to gain this unique and attractive metal shed the final place in the upper half of our league table. A windowless design will certainly boost the security of cheap storage sheds, but it can lead to a dark and gloomy interior; these Palram sheds have a solution to both problems. From the outside it looks to be completely window free, which means that opportune thieves passing by will be unable to see if valuables are being kept inside, which in turn means that it’s less likely to be broken into. The apex roof, however, contains a translucent panel that acts as a skylight so that the interior should be much brighter than you imagined it would be. Whilst it has a base depth of 1.74m the base width is only 1.09m, so this compact footprint makes it eminently suitable for narrow gardens, whilst the peak height of 2.02m still makes it possible to store tall garden items within. The aluminium frame to which the grey coloured plastic cladding is attached makes these cheap storage sheds feel very stable and secure once assembled, and we were pleased to find that whilst a 10 year warranty is provided by the manufacturer, they also provide the reassuring advice that that have an expected lifespan of 20 years. 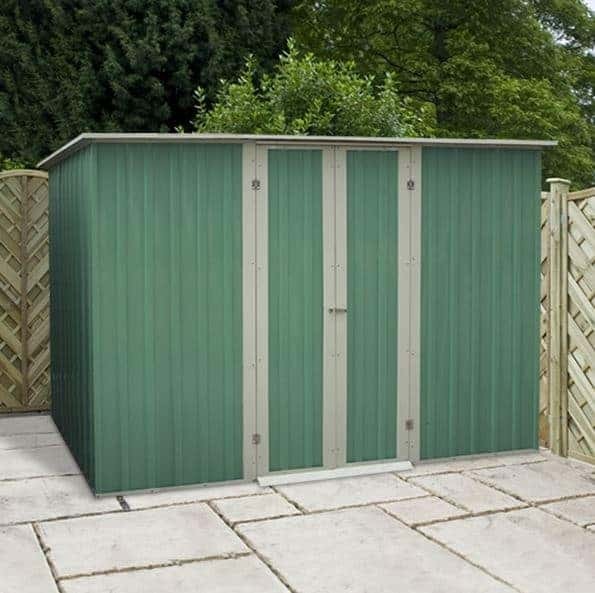 These compact metal clad cheap storage sheds belie their galvanised steel origins with a green colour scheme that should see them blend in nicely to a garden background. Whilst its base area of 1.94 x 1.19 is adequate for small scale storage purposes, the peak height at the top of the apex roof is a little lower than we usually find on the compact metal sheds we review, at 1.72m, so you’ll probably have to stoop down a little when moving in and out of the sliding double doors. The ten year warranty against rust was very welcome, as we found the paintwork very well applied and pleasing on the eye and so we wouldn’t want this to be discoloured by the tell tale signs of corrosion. What impressed us most of all, however was the price. 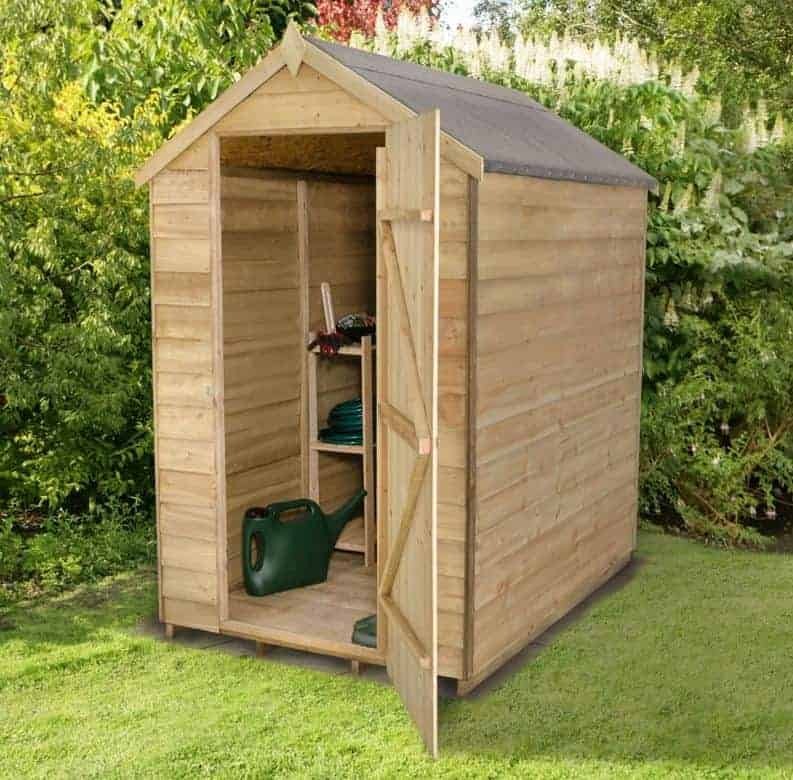 At just under a hundred pounds this is by far the cheapest of the cheap storage sheds to feature on this list, and so if you’re operating on a very strict budget, and are looking to increase the storage potential in your garden, this Rowlinson shed comes highly recommended. The pent roof on top of these cheap storage sheds makes them much less obtrusive than apex sheds, and it also means that you may be able to place them underneath overhanging branches and foliage. We were pleased to find that with a peak height of 2.03m there’s still lots of vertical storage available as well, and the pitch of the roof is very effective at carrying rainwater away. This functions is also carried out by the overlap cladding, and it was good to see that this carries a 10 year anti-rot guarantee with it, even though this is dependent upon an annual wood preserver treatment being applied by the customer. The features that first caught our eye when reviewing these cheap storage sheds was the two well sized windows that are on the front panel adjacent to the single hinged door. They feature polycarbonate glazing, which is very shatter resilient and therefore ideal if you’re likely to have young children playing around the shed. We were also impressed by the extra diagonal bracing applied to the door, and its use of hidden hinges, as this makes it strong and harder to break into. For people who prefer the appearance of pent to apex roofed sheds, this could make an ideal and very well priced garden storage solution. We were pleased to see that these overlap timber clad cheap storage sheds have been manufactured with security as a prime consideration. It means that you won’t have to worry about passers by taking an interest in any tools and equipment that’s stored inside, but it also means that you’ll need to install an artificial light source inside or take a torch with you when you’re retrieving items. This has been taken into account when determining this shed’s position within our league table, but on a positive note it also represents very good value for money with a price tag of less than two hundred pounds. As we expected from wooden cheap storage sheds at this price, overlap cladding has been used for the walls, with solid sheet material used for the roof and the floor. This keeps the cost down, and yet the wall thickness of 8mm still means that it should feel stable and resilient once the assembly has been completed. What impressed us most of all was the fact that the timbers had been given an initial pressure treatment, so you can see goodbye to worries about rot for at least 15 years as well as saying goodbye to having to apply coats of wood preserver during this generous warranty period. 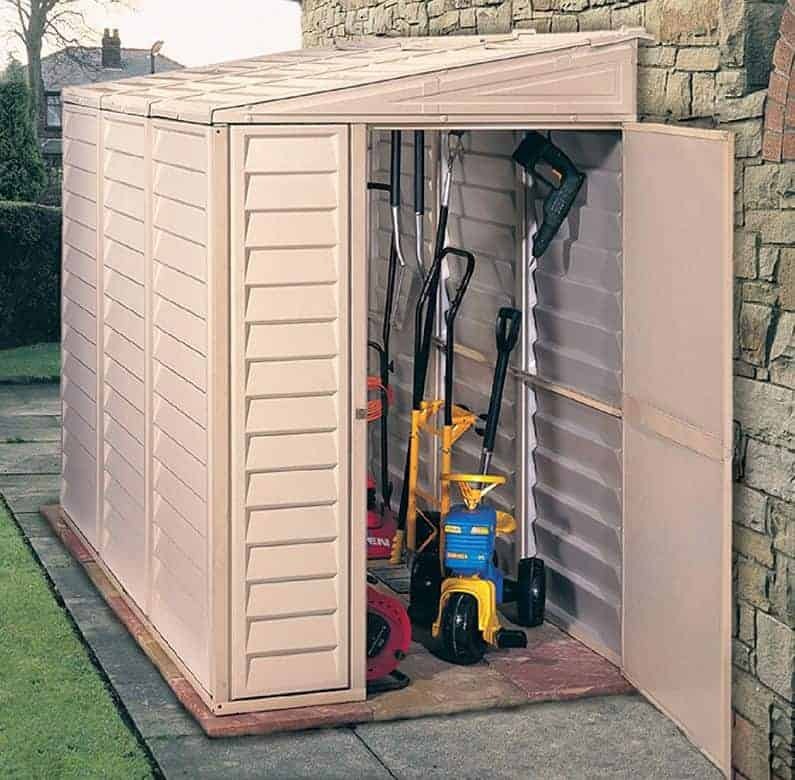 If you’ve previously stuck to wooden cheap storage sheds, but want something that’s easier to manage, then these amber coloured models could be an ideal choice. The cladding itself is designed to resemble shiplap, which we think is another nice stylistic touch, and of course it also helps to carry rainwater away. That’s one reason why the manufacturer has been able to supply a 10 year warranty period with this shed, but with tough polycarbonate cladding allied to a rust resistant aluminium frame we feel they should actually last for much longer. This makes their price tag of just under two hundred and fifty pounds very good value, which is what earns it a place inside our top twenty league table. Once again Palram have added a skylight to the apex roof, which we feel is an ideal lighting solution on a shed as compact as this one. 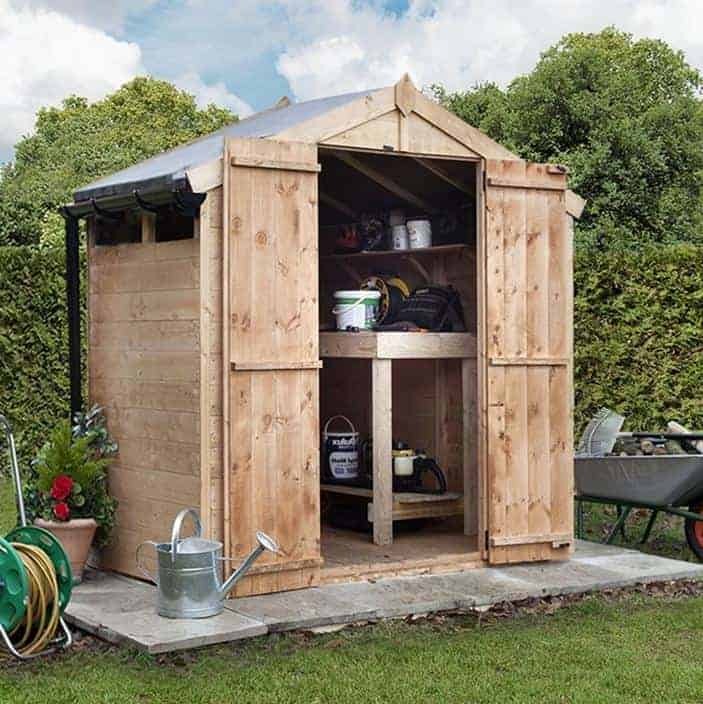 At six foot by three foot, this won’t be suitable for large scale storage, but for a small scale gardener it could be ideal; we can also picture this being used as a supplemental shed for people who find they need just a little more storage space. Another feature we liked was the anti-slip floor, which can come in very useful for people who are walking in from a dew sodden or muddy garden. Thanks to a base area of only 1.73m x 0.96m, this is one of the more compact cheap storage place to gain a place inside our top twenty league table. With a price tag of over two hundred and fifty pounds it’s also not one of the best value sheds in our list, and the combination of these two factors is enough to ensure that this remains in the bottom half of our league table. We did find a lot that we liked about it however, including the golden brown colour scheme that comes complete with a wood effect, making this one of the most visually attractive plastic sheds we’ve reviewed. The compact nature of these cheap storage sheds makes them ideal for people with a limited garden space available as well, and it’s possible to make the most of every inch of space inside, thanks to the wide opening double doors that take up the whole of the shed’s frontage. We were also impressed by the high quality components used and the attention to detail from the manufacturer, as shown by the inclusion of a skylight at the centre of the apex roof. Even more pleasing was the inclusion of a 15 year warranty, which is as long as any warranty we’ve found on the plastic storage sheds we’ve reviewed. 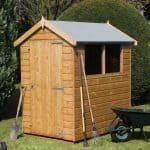 When we review Keter’s range of plastic sheds we are invariably impressed by their build quality and often by their innovative designs as well, so weren’t surprised to find that two of their models earn a place inside our list of the twenty best cheap storage sheds that are available online in the UK today. This particular model is the smallest of all the sheds featured here, with a base area of approximately six foot by two foot. 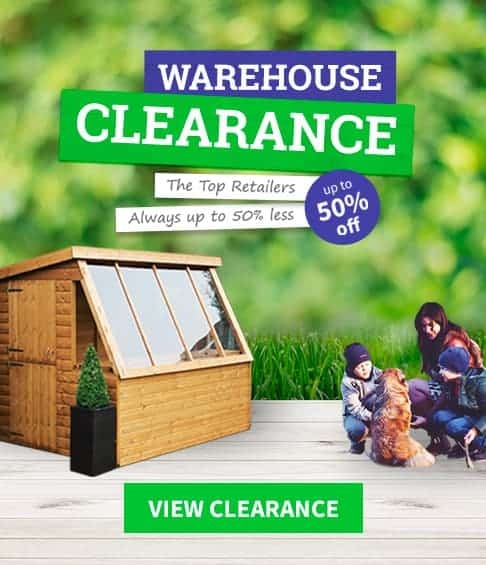 This has been taken into account when determining its position within our rankings, but if you need a relatively small storage area, or are very short of lawn space on which to position your shed, this still has a lot to offer. 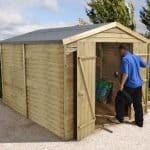 We were pleased to find that although these cheap storage sheds are small and lightweight, they are still very tough and stable. That’s because they are made from double walled polypropylene resin, giving them added strength and added weather resistance as well. This is shown by the 10 year manufacturer’s warranty provided, but we wouldn’t be surprised to find that they last much longer than this suggests. We were also impressed by their appearance, with the nicely contrasting white and black colour scheme, and a wood effect finish that caught our eye for all the right reasons. The vast majority of the cheap storage sheds that we review have either a traditional apex or pent roof, but this adopts a lean to style that brings with it significant advantages. For starters, it means that whilst its base area of four foot by nearly eight puts it among the mid sized range within our league table it doesn’t take away space from the lawn itself. As its designed to be placed against a wall, it also gains added weather protection, which is why we feel this would be a smart choice for people whose gardens are in exposed and often windy areas. As with other Duramax sheds that we’ve reviewed, their lean to cheap storage sheds adopt a stark white colour scheme. This should fit in well, however, with properties that already have a lot of white PVC items on show, such as fascias and soffits, doors and conservatories. As the PVC cladding is supported by a galvanised steel frame it will feel very strong and stable when assembled, so it should prove to be durable and reliable. 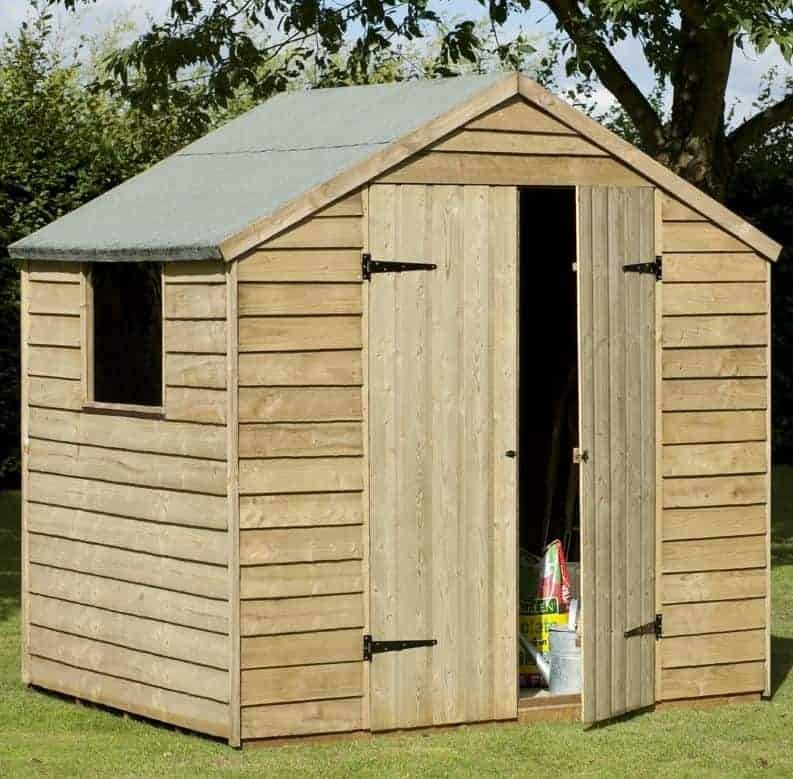 With a 10 year warranty included we feel this represents reasonable value for money, but it is the most expensive shed in our WhatShed guide, which is why it takes its position inside our final three. 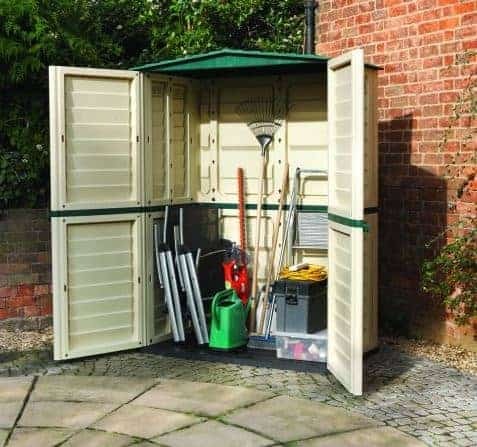 Rowlinson fill the final two spots in our league table of the twenty best cheap storage sheds, but whilst they are both very different to each other they both have something special to offer the consumer. The first thing that impressed us about this six foot by four foot shed is that it’s very attractive, thanks to its smooth honey coloured tongue and groove cladding underneath a felt covered apex roof. Its a very traditional look that we know will prove popular with a lot of people, and it should be enhanced even further with a wood stain or coats of exterior paint. At first glance these cheap storage sheds seem to have a window free design, as adopted by many other sheds in this list, but a second look reveals a small square window just below the diamond shaped finial at the roof’s ridge. This means that whilst nobody can see inside when they’re passing by, there’s still enough light inside on a sunny day to make the storage and retrieval of items an easy process. This then is one of the best illuminated security sheds we’ve seen, as well as one of the most visually pleasing, but its lack of an extended warranty and a slightly higher than average price keeps it in the nineteenth and penultimate position. This is the second smallest of the cheap storage sheds in our league table, but it still has a lot to offer to those who don’t need too large a storage area. It compensates for its base area of 1.51m x 0.83m, approximately five foot by three foot, however with a taller than average height of 1.98m. This makes it a good choice for people who want to store tall items of gardening equipment, but don’t want to use up too much of their lawn space in the process. As it comes complete with a strong and integral floor as standard, it could also be situated on a patio, against a house wall, or even on a balcony. This flexibility is one of the strengths of these cheap storage sheds, and we also found them to be pleasing to the eye, thanks to a cream colour scheme with a green apex roof and a green band running around the middle of the shed. We would have liked to have seen an extended warranty included, and the price is comparatively high when compared to the larger storage facilities we’ve looked at earlier in this league table. As this is such a tough substrate however, and of course not liable to either rot or rust, we feel that it should prove to be a durable and reliable addition to the garden.